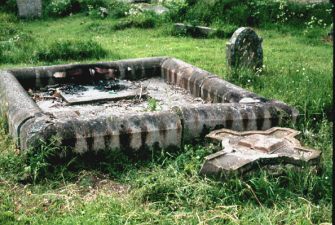 The remains of the memorial to Arthur Inglis, erected over his grave, can be found in the old kirkyard of Cambusnethan, located by the side of the River Clyde, below Wishaw. The image above shows the memorial after renovation work by the SCMA many years ago. Unfortunately, the kirkyard has been subject to repeated acts of vandalism, so it was decided to have a memorial to Inglis erected in a safer location. This was unveiled in 1998 at Wishaw Reformed Presbyterian Church. Erected in the year 1733. To die for Christ upon the spot. Arthur Inglis was farmer who lived at Stockelton Dike, which lay between the kirkyard and Muirhouse. Arthur (sometimes refered to as Alexander) of Netherton was active at the Battle of Bothwell Bridge but survived. He was approached by dragoons under Claverhouse and having a Bible he was shot at. Inglis wasn't hit, but was later struck by a sword which 'clave him in the head'. 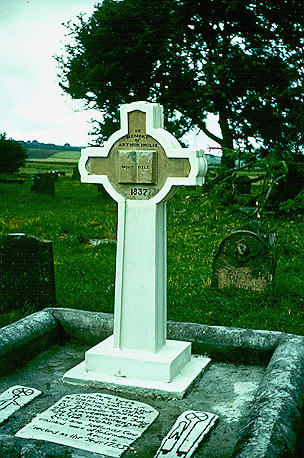 The image above shows the gravestone following vandalism. 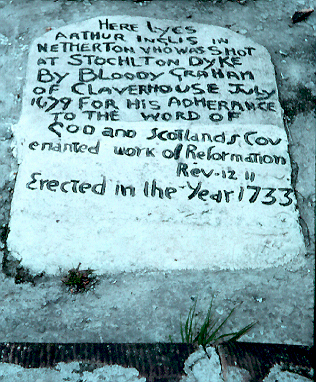 The original gravestone (shown below) was dated 1733 and lies in the square enclosure. The cross was erected in 1837.